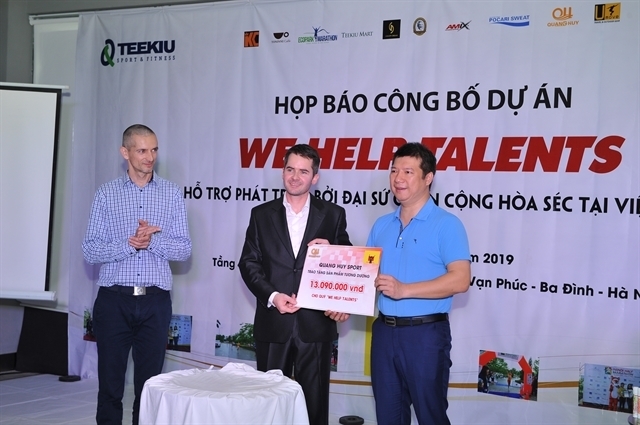 The Embassy of the Czech Republic to Vietnam promised to support Vietnamese athletes through We Help Talents, a fund established on Sunday in Hanoi. Deputy Ambassador Lukas Musil receives sponsorship from enterprises for the We Help Talents fund. Deputy Ambassador Lukas Musil said the non-profit project was developed by the Czech Embassy with the support of many sponsors. Initially, the fund will support athletes in long distance running, especially those who come from mountainous regions. “We will help the athletes develop their skills and capacity to compete at international tournaments,” said Musil. “We will provide support in finance, training and introducing them to tournaments abroad,” he said. Musil said he appreciated the support of partners to bring the project to reality.